Innovation breeds innovation and today’s rockstar constantly shares his creative ideas with the world. 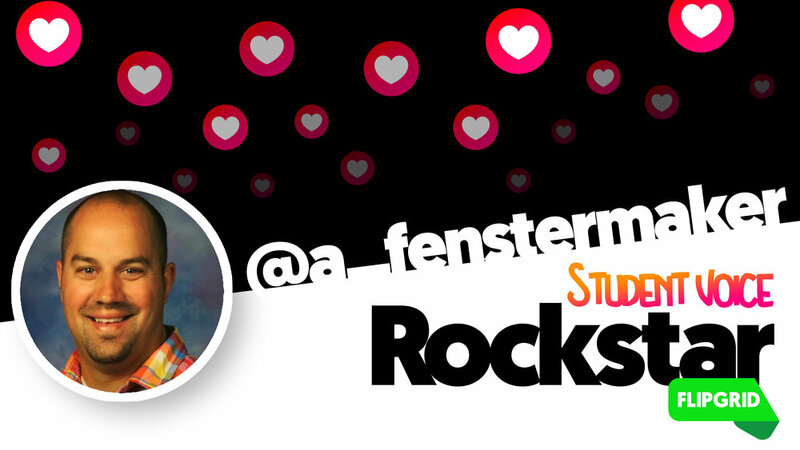 Andrew Fenstermaker, a Tech Coach and Adjunct Professor, from North Liberty, Iowa has been rocking out Flipgrid for almost 2 years! As a Flipgrid Certified Level 1 and 2 Educator, as well as Student Voice Ambassador, Andrew has inspired educators to think outside of the box when amplifying student passions. Andrew often presents at EdCamps and educational conferences and has even had students serve an active role in conference presentations! We had the pleasure of witnessing Andrew in action during the Student Voice Conference at FlipgridLIVE when he presented Amplify My Voice: Student Podcasting. Andrew’s one word for Flipgrid is empowering and we think the same about him! 🌎 Global Read Alouds: We read The Wild Robot and shared our connections on Flipgrid. We had over 2,000 videos submitted and close to 30,000 views. Kids loved it! 🎙 Student Podcasts: We have a single podcasting Grid with each student having his/her own Topic as their podcast. Each video on the Topic is a new episode where students share about their passions. 🤝 Collaborative Learning Projects: We explored diversity among 5th grade classes across our school district using Flipgrid. Moreover, students reflect on learning using Flipgrid as they share their responses to probing questions about stories they have read, ELA skills they have explored and connections they have made. 💕 Spreading Kindness: Students used Flipgrid to create positive video messages that were turned into QR Codes and printed onto our PBIS tickets to remind everyone that they matter. 🎓 Transforming Learning in Higher Ed: We use Flipgrid as a platform to make the asynchronous course more authentic. Grad students share their reflections on their learning, and student feedback on implemented lessons. They also provide feedback to each other in the form of video replies and emoji reactions. With Flipgrid, students have had the opportunity to gain new perspectives. By making their thinking visible and amplifying their voices, students have had the privilege to share and hear from others locally and globally. They feel empowered to own the learning process as they have the freedom to fully customize their videos through the words they share, and adding a little bling to their selfie. Embrace the mess. Don't worry about making everything look professional. Throw a Topic together and let kids start recording. Don't worry about background noise, silly stickers, or drawings. You'll be amazed at what kids come up with when we provide them with an intuitive platform and get out of their way. Their creativity shines! The heart of education is a dedicated educator and if you ever meet Lucretia Anton, she will steal your heart with her passion for creating loving environments for both students and teachers. As an Innovation Coach and past Rancho Lab School Teacher, Lucretia has been rockin’ out Flipgrid in her role for two years! She modeled the quest for continuous improvement by blasting off to become a Flipgrid Certified Educator and serves the Flipgrid community as an amazing Student Voice Ambassador for her school, community, and the larger online PLN known as “FlipgridFever.” Lucretia presents frequently at conferences, including Arcadia Unified Innovation Conference, EdTech Teacher Conference, Fall CUE, Spring CUE, and San Gabriel CUE. We were honored as she assisted with the organization and also presented at #StuVoiceCon18. In January of 2018, Lucretia even shared her amazing tips for creating a fun and welcoming environment for professional learning during the Presenting Flipgrid Webinar. She is a true gem! I love using Flipgrid! It’s simple, engaging, and most of all, versatile. This versatility has really empowered me to let my ideas take form. Much like a kid molding clay into shape after exciting new shape, I’ve been able to “mold” Flipgrid to connect in a variety of ways and across a wide range of ages from preschool students to adults. There is just something magical about using a lively medium like Flipgrid that ignites my creativity, no matter the audience I am working with. You know what is best for your students and community. Period. Trust in the experiences and the possibilities you can create or “mold” utilizing Flipgrid. Let your ideas and creativity take shape. You’ve got this! I’ve found the M 🔮A🔮G🔮I🔮C of replies is most impactful when you give students clear sentences starters for them to focus on when responding to peers. 💡Use replies for peer goal accountability. As a Technology Integration Specialist, I am a teacher of teachers. Working in staff development, I get to show other educators the wonders of Flipgrid...it’s possibilities and the magical things that it can do. It works for everyone at every grade level in every subject area, so it’s my job to show a huge variety of uses & just inspire limitless ideas! I have silly fun Grids for teachers to learn Flipgrid and just experience it for the first time. I do in-class demo lessons that are tailored to any teacher’s content and learning objectives. I always direct teachers to the Discovery Library, where they feel supported by a bazillion ideas from the Flipgrid community! I came up with the idea of a #Fliphunt, which is basically a scavenger hunt using Flipgrid, and it is insanely fun for students - and the teachers who get to watch and evaluate their video responses! I honesty think I come up with new ideas to use Flipgrid every week...I keep finding inspiration all around me! Flipgrid opens worlds. Our littlest learners can get out BIG thoughts because they are able to respond verbally and with all the vibrant emotion that is captured through live video. Our reluctant writers aren’t reluctant speakers - they’re so much more willing to share their brilliance when they can speak and know that others value their spoken voice. Our shy students don’t find it as difficulty to talk to an iPad or a laptop as they would a whole class - and Flipgrid makes it possible for them to be loud and proud. Many of our students would rather take formative assessments by TALKING about what they know openly rather than filling in bubbles with a #2 pencil, and our best educators are enjoying being able to give students a choice in how they’re assessed. For all these and so many more reasons, Flipgrid opens worlds. Jump on in! Start with one Grid - one Topic - one idea. Learn to use Flipgrid with your students, and you’ll soon be adding more & more features to your topics. You’ll try a few new tricks, maybe experiment with a rubric, add a few meaningful attachments, and hopefully explore a little app-smashing! Use the Discovery Library to find inspiration, and then please inspire others by leaving your topics there for others to discover. Connect with the vast, enthusiastic Flipgrid community on Twitter or Facebook, or just check out the Flipgrid blog from time to time to see what others are doing. Lastly, let your students inspire you - they will suggest topic ideas, they will find new ways to use Flipgrid, and they will teach you so much...if you just listen. Check out Kathi’s Rockstar Video! Michael is a true inspiration and the one word he uses to describe Flipgrid is EMPOWERING! 💡- for students to pitch genius hour ideas. 🌍- to cultivate connections based learning opportunities and global education experiences through a STEM Hub as well as with Flipgrid Explorer series. 🖥- to build a virtual tour of our High School by embedding teacher introductions and videos into a 360 photosphere. 🏕- for students to share their learning from a student edcamp. 📣- for teachers to give shout outs to colleagues during a district edcamp. Flipgrid has opened up our classroom to each other and the world. It creates a safe space to share our thoughts, ideas, questions and curiosities. It also has brought a great deal of fun. Due to the ability to appsmash with so many other tools such as Chatterpix or Adobe Spark, it empowers students to get creative and empowers the shy students to share. It has opened up our minds but more importantly our hearts as we connect and learn with each other and the world. Since Flipgrid is so simple to use for both students and educators, we can maximize our time spent amplifying voice! The impact is evident and likely reaches beyond what we are even able to see. Thank you, Flipgrid! Explore the Discovery Library and hashtag #FlipgridFever to get ideas from the users. It is guaranteed to spark an idea that will work in your classroom. Also, take time to reply to students through a response or feedback. People thrive on connections and communication, with each other and with the important adults in their life. This is your chance to #BeTheOne! Have fun with the stickers and selfies. We teach the selfie generation and meeting them in this way through Flipgrid gets everyone on the same level. Also, always be willing to discover something new with Flipgrid. It keeps getting better all the time! Jessie, a 6th grade teacher, from St. Petersburg Florida has been rockin' out Flipgrid for a year and a half. As a Flipgrid Certified Educator and Flipgrid Ambassador she serves with an open heart fellow educators in their quest to meet the needs of their students through amplifying voice. To Jessie, utilizing Flipgrid in the classroom leads to EMPOWERMENT! In my classroom, students are no longer afraid to speak. Flipgrid has assisted in building a community of thinkers who know it's ok to make mistakes, but also to share those with one another. Not all of your students are going to be super on board at first - and that is ok. I always give my students an option to write if they are uncomfortable with video. But by the end of the year, most of them want to participate with their peers. Don't force it.